Zinc Aluminum Gabions - Buy Zinc Aluminum Gabions Product on Hebei Gabion Hardware Wire Mesh Co., Ltd.
Zinc aluminum Gabionthe pure zinc coating. 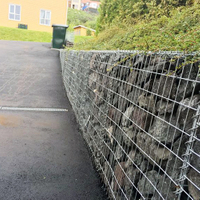 Experiments show that the corrosion resistance of the pure zinc coating is more than 3 times, so people pay more and more attention now, the developed countries in Europe and America are 10% stone cage nets (Zn Al alloy) to replace the traditional pure zinc layer of stone cage net cage. Net moment type cage using zinc aluminum alloy steel wire produced by our company is woven, its use in the life of 70-80 years, is 3 times that of ordinary galvanized layer of steel, and zinc aluminum alloy wire in line with national standards: GB/T 20492-2006. The aluminum content in the coating is 10% time, corrosion is 5g/ square meters / year. The aluminum content continues to rise, the amount of corrosion increased, until the aluminum content reached 40% of the time, only to 5g/ square meters / year. So, on the corrosion resistance ability and economic point of view, the galvanized steel wire is most suitable for 10% aluminum alloy. My company production of 10% Al Zn alloy stone cage net is the use of domestic and foreign advanced equipment, double twisted hexagonal wire mesh weaving, wire diameter of up to 2.00M-4.00MM. In order to improve the structural strength of each cage, cage as a spacer in the average 1M interval. 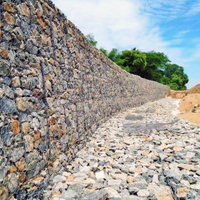 Gabion during the weaving process, the edge of wire diameter to a specification of wire is twisted warp and weft double wire diameter, in order to improve the fastness of the mesh. * economy. Just a stone into the cage and sealing. * the construction is simple, do not need special technology. * has the very strong resist natural damage and corrosion resistance and resistance to bad weather ability. * between the whiteness of silt stone cage to plant production, and natural environment as a whole around melt. 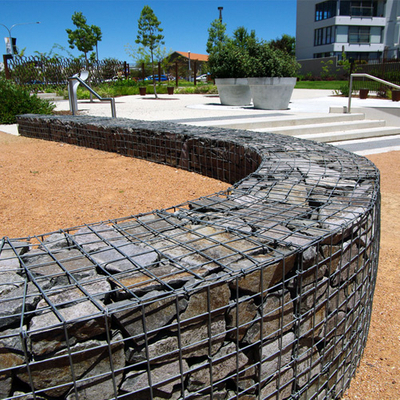 The project site filled with stone forming block structure supporting flexible, waterproof, and for ecological protection engineering. 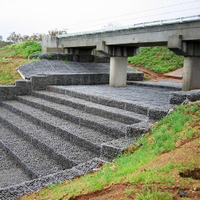 If the environmental conditions are relatively poor, pollution is serious, can be on the surface of the plastic coated steel wires (PVC), so the 10% Al Zn alloy stone cage net is widely used in port engineering, rivers and flood control and guide, spillway dam and diversion dam, bridge, protection, soil structure and coastal defense engineering. 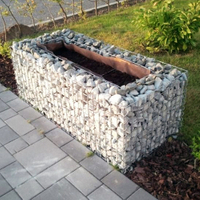 Hebei Gabion Hardware Wire Mesh Co., Ltd.